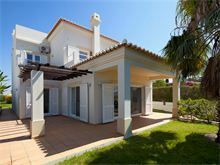 This villa borders the very popular Areias dos Moinhos development which is within walking distance of Carvoeiro although there is a local supermarket about 600m walk away (part of the walk via a country lane). This makes the property ideal for those more active who like to have the choice to walk out in the evening for meals or for afternoons at the beach rather than always relying on the car. The interior is bright and modern with plenty of comfortable seating, a good quality kitchen and brightly coloured furnishings throughout. Approximately 600m from the nearest supermarket, and 1.5 kms from the beach. Entrance hall, off which is the sitting room with TV and CD, dining area, modern white fitted kitchen with microwave and dishwasher. 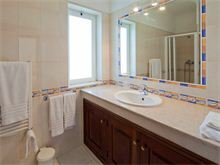 1 double bedroom and 1 twin bedroom share 1 shower room. 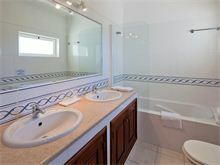 Upstairs to a huge master bedroom with balcony and en suite bathroom, 1 twin bedroom with balcony and en suite bathroom. Maid service 5 times per week, laundry by arrangement. Pool heating and air conditioning (bedrooms only) are available at extra cost, if required. We were a party of five adults and four children aged from under 2 years to 6 years. The villa and location were perfect for us. The villa is spacious and not so immaculate as to cause problems for the children, who were able to run about freely. Carvoeiro is a very pleasant town with many excellent restaurants, so eating out was easy. There is live music in the square every evening and a very pleasant family atmosphere, including lots of Portuguese families. It was great for dancing. 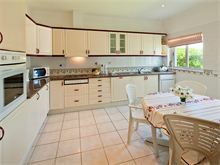 The house is close to several beautiful beaches and there are two supermarkets just a ten minute drive away, Intermarche and a brand new Apolonia so it was very easy to keep the house stocked up. All in all an excellent holiday destination. We’ve stayed at Casa Gina on a couple of occasions. Excellent Villa in excellent location. Enjoyed a lovely family holiday at Casa Gina with great weather and so the pool was used by all. Not too far from Carvoeiro but need a car. Casa Gina was a lovely villa and met all our requirement for a family four. Pool was fabulous with plenty of sun loungers and parasols. Rooms were spacious and nice and bright. 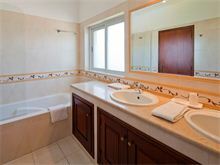 Good location with 10 minute walk to the restaurants in the evenings. Our maid was very accommodating and made the stay all the better. Overall super villa and will be back soon. 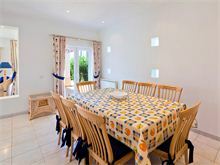 The villa offers great accommodation and lovely space for large parties. Short taxi ride to town is preferable as a couple of big hills to negotiate and the beach is a nice little bay. Casa Gina was beautiful we stayed with four other friends and had a fantastic holiday the pool was lovely and the villa spacious and perfect for our needs. The villa was so lovely, super-clean, spacious and very nicely furnished. We wanted for nothing. The pool, whilst not large, was a good size just to float around in. We walked down to the town every evening for cocktails and dinner (and karaoke) and got a taxi back for 4.70 euros. We felt very safe and secure and would definitely love to go back (missing it already). The villa was just as described and shown in the photographs. It has everything you need, for a relaxing Holiday. The maid service was excellent, and the villa was spotless. 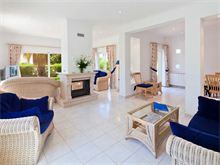 We would definitely use Affinity Villas again, there service and attention to details is first rate. Second year at Casa Gina. It's turning into our home away from home. Great location and great facilities. The villa was lovely,just as described. This was our second booking with Affinity Villas, the service was excellent any questions were answered and the staff in the office are very knowledgeable about the villas. Good service when we arrived with a house manager always available for any questions. We had a lovely maid who came each day to clean always pleasant and smiling. 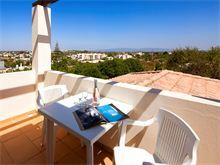 We would definitely always use Affinity Villas when staying in the Algarve a very good company, Thank you. 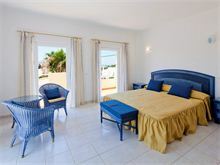 The Villa was excellent, everything and more you could have asked for, amenities close by, very quiet area and peaceful. This is the second time at this Villa through Affinity and are considering a third visit next year.